At approximately 5:45 p.m. last night, February 1, 2019, Santa Barbara County Sheriff’s deputies from the Solvang Station, Santa Barbara County Fire personnel, and American Medical Response (AMR) personnel responded to a residence in the 100 block of Kalawa Shaq in Santa Ynez for a report of an unresponsive 29-year-old male. The reporting party told Dispatchers that the man was unconscious and not breathing. A deputy assigned to the Chumash Reservation and surrounding Santa Ynez Valley was the first to arrive on-scene within minutes of the initial call. Upon arrival, the patient was unresponsive and had begun to turn blue. Believing this was an opioid overdose, the deputy administered a single dose of his department issued Naloxone nasal spray. That same deputy then began CPR on the patient. Once Santa Barbara County Fire personnel arrived on-scene they took over lifesaving efforts. Prior to being transported to the hospital, the patient was alert and breathing on his own. The patient was then transported to a local hospital by AMR medics for further treatment. 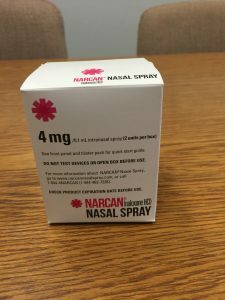 Naloxone Hydrochloride, more commonly known by the brand name NARCAN®, blocks the life-threatening effects of opioid overdose (both medications and narcotics) including extreme drowsiness, slowed breathing, or loss of consciousness. Due to the quick thinking and actions of the law enforcement personnel, this incident ended with a life saved instead of a drug overdose death. All Santa Barbara County Sheriff’s deputies receive training on the use of Naloxone. This lifesaving training is accomplished through the combined effort of the Sheriff’s Office and the Santa Barbara County Emergency Medical Services Agency. The Sheriff’s Office has deployed naloxone 17 times since our program became operational in April of 2017.